PHA (NSW & ACT) member Sue Castrique’s long-awaited history of the convict period on Cockatoo Island was launched at History House in Sydney on 26 November. This work deals with corruption, patronage and intrigue, constant features of NSW politics in colonial times just as they are now. Under the Colony’s Eye tells the story of the struggle to build a dock on Cockatoo Island and introduces readers to an autocratic superintendent who turned the island into a secret fight club with his bare-knuckle prize-fighting convicts. There is much more in this exciting narrative history, in many ways a microcosm of colonial life, for anyone interested in the story of this iconic island in Sydney Harbour. In launching Under the Colony’s Eye Geoff Bailey, executive director of Sydney Harbour Federation Trust, which is responsible for Cockatoo Island, commented on the important role Sue played in helping to make this important historic site accessible to Sydneysiders. As visitors to the island will know the audio guides and signage – partly the result of Sue’s exhaustive research – are uniformly of a high quality and provide a nuanced introduction to the island’s history. Anchor Books Australia, a small, independent publishing company, has done a fine job in publishing Under the Colony’s Eye. The brainchild of PHA members in NSW and Victoria, Anchor Books has a focus on sharing quality Australian history with the public. It began operating in 2008 and now has to its credit 14 publications, including Islands of History Proceedings of the 25th Anniversary Conference, Professional Historians Association (NSW), Norfolk Island (July 2010). Many of Anchor Books Australia’s ‘stable’ of authors – including PHA members – are highly-regarded historians, heritage advisors and researchers. Congratulations Sue on the book and the launch. The convict history of Cockatoo may be the least known of the 11 world heritage listed Australian Convict Sites, and that is now being rectified. 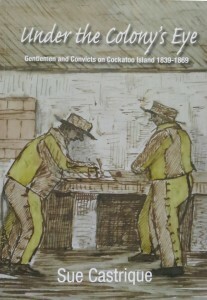 I personally am very pleased to see one of our members has brought the strong personalities of that era back to life (for example, the fantastically named Gother Mann), and provided some valuable insights into the ways in which convict labour wrought such a fundamental transformation of the island’s topography and prepared it for its later role in naval history. The production values of Under The Colony’s Eye are excellent, and all the illustrations are reproduced with great clarity and colour. They are themselves important historical documents, made even more-so my the highly visual media age we live in. It was also good to see quite a few PHA NSW & ACT members at the launch, as well as a PHA Vic member, and also a few prospective new members.